It has been almost two years since Amazon disrupted the retail grocery and natural foods retail sector in announcing its $13 billion acquisition of natural foods retailer Whole Foods. In our initial Supply Chain Matters commentary reflecting on this acquisition, we declared that business as usual was no longer an option for the food and grocery retail industry and its associated supply chain ecosystems. Tomorrow, Amazon will cut Whole Foods prices on more than 500 products by an average of 50 percent on select items. Additionally, Amazon Prime members would more than likely to benefit from more weekly deals, a likely effort to outdo traditional weekly shopper discounting promotions from other food retailers. 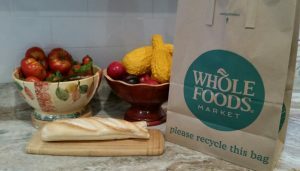 Prior to the acquisition, Whole Foods was dogged by a reputation for quality products but with very high prices. The term “whole paycheck” was often associated with a shopping trip. This latest move is the broadest set of price cuts since the acquisition of the natural foods retailer, and likely represents a de-facto acknowledgement that previous strategies of assimilating physical brick and mortar and online models was not meeting expectations. Whole Foods retail stores continue to be dogged by inventory management challenges, especially related to Amazon Prime online ordering. Reports of missing items or mismatched substitutions prevail. In March, The Wall Street Journal reported that Amazon was planning an entirely new chain of grocery outlets across the U.S., unrelated to Whole Foods. Such a move is speculated as a means to boost revenue growth in the food sector and to perhaps provide online and in-store shoppers different choices in food selection and retailing concepts. From our lens, these moves are yet further aggressive actions by the online giant in its market-share assault on existing U.S. grocery retailers such as Kroger and Walmart. Both competitors have visibly stepped-up their investments in updated merchandizing and online customer fulfillment capabilities, while holding the line on pricing, and that has resulted in far more positive segment revenue growth. Target, also with a major presence in food retailing, has similarly invested aggressively in combination in-store and online fulfillment of grocery and food needs. With the new move for increased investment in added brick-and-mortar food stores, Amazon can leverage its online same day or hourly “last mile” delivery capabilities with more localized regions where there is not a significant Whole Foods presence. Different pricing and merchandising strategies can also be leveraged and deployed. Make no mistake that Amazon has the deep pocket cash generating resources to disrupt the food and grocery retailing sector as the online retailer has accomplished in other sectors. In the specific case of Whole Foods, this latest development can be viewed as hitting the reset button. PreviousIs Today April Fools Day in Global Trade or Another Chapter in Industry Supply Chain Risk Mitigation?